Experience of making cylinder heads from vermicular graphite iron for highly forced diesel and gas-piston engines of the new generation The article discusses the peculiarities of powerful engines of the new generation and requirements to the materials of their most complex part – cylinder head. The studies have shown that vermicular graphite iron meets those requirements most of all. Presented are the results of selecting a technology for making the head by simulating the processes. Key words: Vermicular graphite iron, engine cylinder head, investment casting, gating-and-feeding system, simulation. The joint influence of silicon and nodular graphite on the amount and composition of structural components and carbide phase of metallic base of medium-alloyed chromium nickel iron, as well as on its mechanical and service properties has been studied. Key words: Medium-alloyed chromium nickel iron, nodular graphite, structural components, carbide phase, metallic base, abrasive wear resistance, mechanical properties, carbon, austenite. The article discusses the development trends for the technology of making pattern compositions for investment casting of high-temperature alloys, as well as modern pattern compositions and the requirements to them. Domestic and foreign classifications of pattern compositions are presented. Their properties and influence on the quality of compounds are discussed. Causes of rejects in pattern making are analyzed. It is shown that pattern compositions being developed should be competitive, high-quality materials, while keeping low cost. Key words: Model compositions, investment casting, gas-turbine engine blade. Discussed is the application of the vertical-slit gating-feeding system for casting in a combined mold (chill mold with a sand core) in the production of thin-walled large-size body castings from Mg alloys. Key words: Mg alloy casting, vertical-slit gating-feeding system, directional-consecutive solidification, computer-aided simulation. The article discusses the advisability of regulating the technological parameters of shell mold making and their influence on mold strength and density. Shown is the advisability of applying to resin-bonded sand an initial pressure of 0.25 … 0.32 MPa that is not stationary during the formation of the shell, with its subsequent lowering it by 0.04 … 0.07 MPa in 10 s and, then in another 10 s, increasing it by 0.12 … 0.15 MPa. In the end, all that allows decreasing the content of expensive binder and the cost price of castings. Key words: Shell mold, strength, density, pressure, temperature, sand, resin. Discussed are the possibilities of strengthening the die tooling by chemical-and-thermal treatment methods. The most promising is the treatment that is done in powders of alloying elements and their compounds of complex composition. Such treatment enhances the erosion resistance of press molds, but not efficiently enough. To enhance the erosion resistance the chemical-and-thermal radiation treatment was used. The tooling resistance was evaluated by the number of heat-change cycles in making Cu alloy castings by pressing under crystallization. As a result of chemical-and-thermal radiation treatment the erosion resistance of press molds increased 3.5 – 3.7-fold as compared to strengthening by chemical-and-thermal treatment only. Key words: Strengthening, pressing under crystallization, chemical-and-thermal radiation treatment, irradiation with electrons. 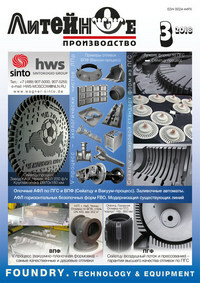 Technologies of casting in cold-hardening sand molds based on organic resins and inorganic metal-phosphate binders are compared. The use of the latter is more preferable for a number of technological indices. Also, environmental problems are completely resolved without any additional investments. Key words: Cold-hardening sand mold casting, inorganic binders, alumoborphosphate concentrate, ABPC, high-efficiency environmentally safe technology.